Matsuyama Eye Clinic was newly founded near Hiroshima Station in Hiroshima City in April, 2018. Our goal at Matsuyama Eye Clinic is to provide comprehensive eye care servises of the highest quality and value by combining medical expertise and advanced technology. For this reason, we provide various local vision services and out-patient surgeries described below. We're willing to deliver competent and compassionate eye care with a commitment to personal service. 'Danbara Square' is a medical complex which includes Ophthalmology(2F), Internal Medicine and Surgery(1F), Urology(4F), Dermatology(4F) and Dental Office(3F). 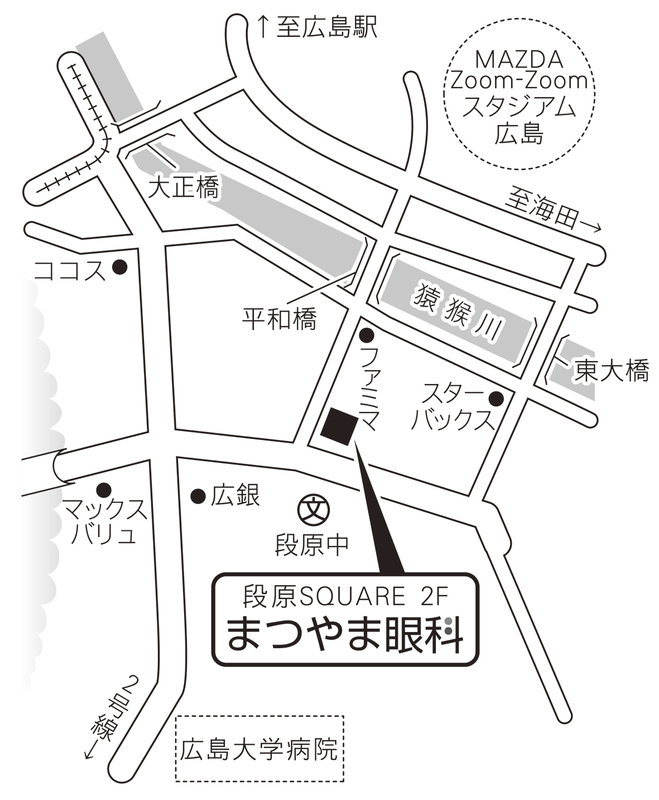 If you take a taxi, please ask 'Danbara Square' or show the map above. It takes about 7min. from Hiroshima Station. If you don't have a Japanese insurance card, you will have to pay the full fee in cash or creditcards. We're ready to write 'Medical Expenses Receipt' in case of applying for your insurance program when you go back to your country. Matsuyama Eye Clinic combines excellent surgical care with the conveniences of an out-patient facility. Out-patient procedures are less expensive and more focused on indivisual care, than comparable hospital surgeries. We provide these out-patient sugeries below. ・Cataract Surgery : It takes within 10 min mostly without any pain. Shigeo Matsuyama graduated from Hiroshima University School of Medicine in 1995 and received a doctral degree in cancer research in 2006. He previously practiced in the department of ophthalmology of Hiroshima University Hospital, Hiroshima Prefectual Hospital, Asa Citizens Hospital, Onomichi General Hospital and private clinics for over 23 years. He has acquired extensive medical experiences, seen various patients of all ages and surgically saved more than 15,000 eyes so far. Copyright (C) 2017 まつやま眼科 All Rights Reserved.